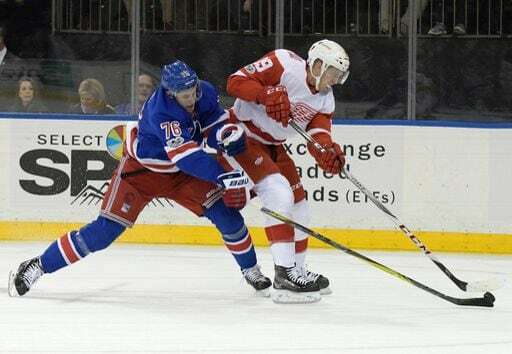 The Rangers are in Detroit tonight in their first of four big games for draft positioning. All four opponents (Detroit, Vancouver, Edmonton, Devils) are below the Rangers in the standings, thus all four have major implications on draft positions. You never root for your team to lose, but I won’t judge you for it for the next week. It looks like the Rangers are again going with 11F/7D, something that continues to baffle me. David Quinn is getting good development out of several kids this year, so I’m not going to question it. I’m just confused by it. Crazy Prediction: A shorthanded goal. Seriously, when was the last time we had one? "Game 67: Stretch of 4 #tankathon games begins in Detroit", 5 out of 5 based on 1 ratings. It will be a pain free game , maybe we can coax DayTwaa into taking Smith back in the off-season? One can dream ? Now we need to get ADA away from the pylon , Staal almost had a beautiful assist in the last seconds of the first period! Kreider must be hurt, he isn’t playing much this game????????? Maybe he has a cold like Staaal , oh wait Staal is still playing ! Another good game , another useless point! We’re just picking 10th again. Sure, play the sick players … it isn’t like we have extra guys sitting in the press box or anything. I miss watching angry Kreider.